Michael Drayton - Middlesex & Hertfordshire. In 1612, Michael DRAYTON published the first edition of his "Poly-Olbion" which was a book of verse about the countryside of England and Wales illustrated by antique maps depicting Tracts, Rivers, Mountains and forests in each respective area. The final edition was published in 1622. Margins cropped close to printed border on the top and vertical margins as shown. Right margin extended with later paper. More Info An antique map of Pembrokeshire by Pieter Van den Keere. The maps of England and Wales by Van den Keere were based on those of Christopher Saxton and in 1627 publisher George Humble "published a major edition of Speed's Atlas," who in turn "also issued" the van den Keere maps "as a pocket edition thereby van den Keere's works came to be known as "Miniature Speeds". Brown stain in right margin. An antique map of Pembrokeshire by Pieter Van den Keere. The maps of England and Wales by Van den Keere were based on those of Christopher Saxton and in 1627 publisher George Humble "published a major edition of Speed's Atlas," who in turn "also issued" the van den Keere maps "as a pocket edition thereby van den Keere's works came to be known as "Miniature Speeds". Brown stain in right margin. Diagram of the Alterations Proposed by the Boundaries Commission, in the County of Hertford. More Info Local Government Boundaries Commission. 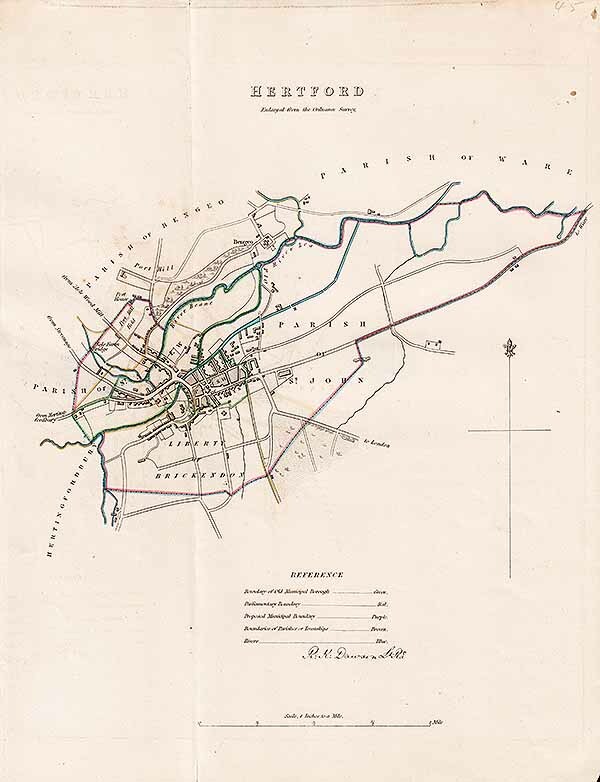 Diagram of the Alterations Proposed by the Boundaries Commission in the County of Hertford. Indicates which parishes were added and those that were removed, and shows new and old county boundaries. Scale 4 miles to 1 inch. By R. Owen Jones and printed by Dangerfield Lith. 22, Bedford St, Covent Garden. Circa 1880. Local Government Boundaries Commission. Diagram of the Alterations Proposed by the Boundaries Commission in the County of Hertford. Indicates which parishes were added and those that were removed, and shows new and old county boundaries. Scale 4 miles to 1 inch. By R. Owen Jones and printed by Dangerfield Lith. 22, Bedford St, Covent Garden. Circa 1880. Hertford Town Plan - R.K. Dawson. 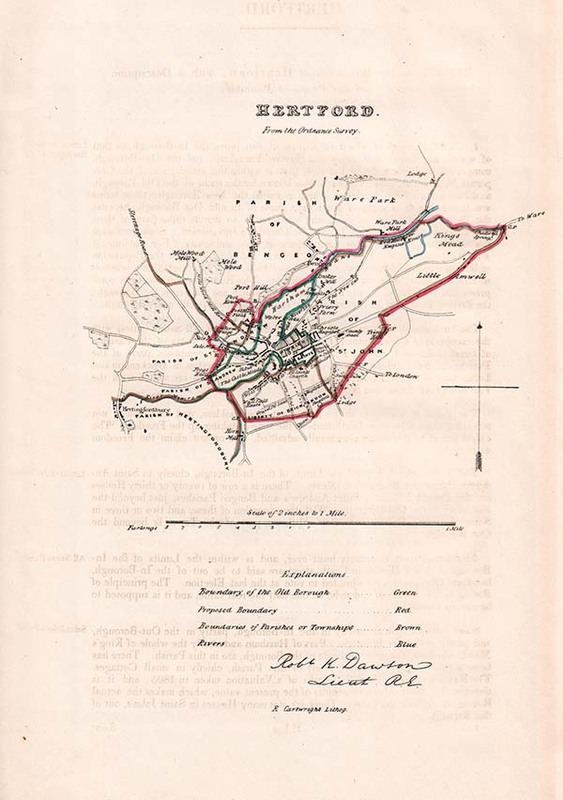 A detailed plan showing the existing boundaries and the proposed boundary changes produced by Lieutenant Robert Kearsley Dawson, Royal Engineers, whose distinctive signature appears on each of these maps and plans. These maps and plans were the result of the Reform Bill of 1831 and the Boundaries Act of July, 1831. Circa 1832 - 37 with original colouring. Some offsetting. Approx 17cms by 21 cms. An antique map by Emanuel Bowen 'Engraved for the General Magazine of Arts & Science for W. Owen at Temple Bar 1759' with later hand colouring. Several vertical folds. An antique county map published by George Augustus Walpoole and Alexander Hogg (London) in "The New British Traveller" in 1784 with later hand colouring. Engraved by Thomas Conder. Decorative title cartouche and arms of Hertfordshire. Trimmed to printed borders on all four sides. In 1612, Michael Drayton published the first edition of his "Poly-Olbion" which was a book of verse about the countryside of England and Wales illustrated by antique maps depicting Tracts, Rivers, Mountains and forests in each respective area. The final edition was published in 1622. Margins cropped close to printed border on the top and vertical margins. Later hand colouring. An antique county map published in "Lewis's New Traveller's Guide, or a Pocket Edition of the English Counties, Containing all the Direct & Cross Roads in England and Wales. With the distance of each principal place from London." Published by W. Lewis, No. 21, Finch Lane, Cornhill. 1819. Contemporary hand colouring and comes with a page of descriptive text. Slight spotting and dust soiling. Approx 24cms by 17 cms. An antique county map by George Carrington Gray which was published in his 'Gray's New Book of Roads. The Tourist and Traveller's Guide to the Roads of England and Wales and Part of Scotland on an Entirely new Plan.....' Published in 1824 with later hand colouring.The map is a reprint of the one issued in 'The Modern British Traveller , or Tourist's Pocket Directory' by George Alexander Cooke 1802 - 1810. More Info An antique county map published in 'Pigot & Co.'s British Atlas comprising the Counties of England, upon which are laid all the Railways completed and in Progress'. A detailed map of the county which provides information on the county such as rivers and canals, and railway network data. Published in 1839 with contemporary hand colouring. The original page of text which accompanies this map shows the statistics from the Census Return of 1831 and is included in the purchase. Inset view of St. Alban's Abbey Church. An antique county map published in 'Pigot & Co.'s British Atlas comprising the Counties of England, upon which are laid all the Railways completed and in Progress'. A detailed map of the county which provides information on the county such as rivers and canals, and railway network data. Published in 1839 with contemporary hand colouring. The original page of text which accompanies this map shows the statistics from the Census Return of 1831 and is included in the purchase. Inset view of St. Alban's Abbey Church. This antique county map of Hertfordshire by Robert Morden was first published in 1701 in a work entitled "The New Description and State of England" however, a subsequent edition by Herman Moll in 1708 added a compass indicator and other detail. The colouring is later. Four vertical folds. This antique county map of Hertfordshire by Robert Morden was first published in 1701 in a work entitled "The New Description and State of England" however, a subsequent edition by Herman Moll in 1708 added a compass indicator and other detail. The colouring is later. An antique county map of Hertfordshire from "Theatre of Great Britaine" by John Speed, published by Thomas Bassett and Richard Chiswell in 1676 with later hand colouring. English text to verso. Good margins with one old repair in bottom margin. A rare antique county map from "An Atlas of England containing A Map of England..... " Printed and sold by R. Butters, No. 22, Fetter Lane, Fleet Street. 1803. Original outline colouring and orientated with North to the left. More Info An antique county map drawn and engraved by Sidney Hall. Published by John Gorton in 'A Topographical Dictionary of Great Britain and Ireland.' in 1833 with later hand colouring. Two vertical folds as published. An antique county map drawn and engraved by Sidney Hall. Published by John Gorton in 'A Topographical Dictionary of Great Britain and Ireland.' in 1833 with later hand colouring. Two vertical folds as published. An antique county map by Emanuel Bowen, Thomas Kitchin and R.W. Seale. Published in "The Universal Magazine of Knowledge and Pleasure.......Published Monthly according to Act of Parliament, For John Hinton, at the King's Arms in St. Paul's Churchyard, London." Circa 1751 with later hand colouring. Has two vertical folds. This rare and curious antique map of Hertford, Bedford, Huntingdon and Cambridge was produced from the research of Aristide Michael Perrot and engraved by Adrien Migneret, was published in G. B. Depping's L'Angleterre. Ou Description Historique et Topographique Du Royaume Royaume Uni De La Grande-Bretagn in 1823. This map, a copper plate engraving, has original outline hand colouring. Some maps show a single county, but more often two or more counties were joined to form a group which is similar in industry, agriculture and terrain. An antique county map published by George Philip & Son, London & Liverpool, in "Philips' Atlas of the Counties of England including Maps of North & South Wales, The Channel Islands and the Isle of Man". Circa 1880. Centrefold as published. More Info This antique county map was published in the "Parliamentary Gazetteer of England and Wales" in 1843 with later hand colouring. This map is the same as those issued in 'A New Comprehensive Gazetteer of England' by James Bell 1833 - 34. They now have railways added. A vignette view of St. Alban's Abbey Church top left corner. Vertical centrefold as published. This antique county map was published in the "Parliamentary Gazetteer of England and Wales" in 1843 with later hand colouring. This map is the same as those issued in 'A New Comprehensive Gazetteer of England' by James Bell 1833 - 34. They now have railways added. A vignette view of St. Alban's Abbey Church top left corner. Vertical centrefold as published. An antique county map by Thomas Kitchin which was published by Alexander Hogg in "The Antiquities of England and Wales Displayed in 1795 with later hand colouring.. This antique county map was published in 'A New Comprehensive Gazetteer of England' by James Bell 1833 - 34. A vignette view of St. Alban's Abbey Church top left corner. Three vertical folds as published. An antique county map engraved by John Cary and published in his ' New and Correct English Atlas ' on July 1st, 1809 with original outline colouring. More Info An antique county map of 'Hartford Shire' published in "Bowles's New Medium English Atlas...." 3rd January, 1785 with contemporary outline colouring. Therse are re-issues of those by Emanuel and Thomas Bowen published by Thomas Kitchin in 'Atlas Anglicanus, 1767'. The distances to London have been added to all the principal towns. An antique county map of 'Hartford Shire' published in "Bowles's New Medium English Atlas...." 3rd January, 1785 with contemporary outline colouring. Therse are re-issues of those by Emanuel and Thomas Bowen published by Thomas Kitchin in 'Atlas Anglicanus, 1767'. The distances to London have been added to all the principal towns. This antique county map of Hertfordshire was engraved by the Dutch cartographer Herman Moll and was published in his New Description of England and Wales an atlas of the English and Welsh counties in 1724 with later hand colouring. An antique county map engraved by James Wallis and published in "Ellis's New and Correct Atlas of England and Wales....." in 1819 with contemporary hand colouring. This atlas is a re-issue of James Wallis's "A New and Improved County Atlas" of 1812. An antique county map by John Cowley. Published in "The Geography of England: Done in the manner of Gordon's Geographical Grammar" and printed for R. Dodsley at Tully's Head, in Pall Mall in 1744 with later hand colouring. An antique county map published by William Lewis in 'Lewis's New Traveller's Guide and Panorama of England and Wales' in 1836. .
F. S. Weller, F.R.G.S. - William Mackenzie. An antique county map by Francis Sidney Weller, F.R.G.S. Published by William Mackenzie, London, Edinburgh & Glasgow. in "The Comprehensive Gazetteer of England & Wales." Circa 1893 - 1895. There is overprinted colour to identify Parliamentary divisions.with scale below and Key to railways, roads and canals. John Bartholomew - George Philip. An antique county map drawn and engraved by John Bartholomew published by George Philip & Son London & Liverpool, in " Philips' Handy Atlas of the Counties of England in 1879. An antique lithographic county map published in "The Travelling Atlas of England and Wales shewing the Railways, Roads, Cities, Towns, Parks, Gentlemen's Seats &c. &c." in 1858 with contemporary hand colouring. Printed and Published by John Heywood, 170, Deansgate, Manchester. Piano-key border. An antique county map by George Alexander Cooke published in 'Topography of Great Britain, or British Traveller's Pocket Directory' by Sherwood, Neely and Jones. Circa 1806 - 1822 with original hand colouring. Hertfordshire by J. & C. Walker. An antique county map engraved by John & Charles Walker which was published in "The British Atlas" in 1851 by Longman, Rees, Orme, Brown & Co. Showing the Roads, Railways, Canals, Parks, Boundaries & Boroughs &c. Original outline and wash hand colouring. An antique county map drawn by R. Creighton and engraved by J. & C. Walker. Published in the "Atlas to the Topographical Dictionaries of England and Wales" by S. Lewis and Co., 13, Finsbury Place, South in 1849. Original outline colour. This antique county map of Hertfordshire was published by Francis Grose in "Supplement to the Antiquities of England and Wales" in 1787 using John Seller's maps of 1695. Later coloured by hand. Text continues on verso. An antique map by John Owen and Emanuel Bowen which was published in "Britannia Depicta or Ogilby Improv'd.......... (1720-1764)" with later hand colouring. A decorative and finely engraved cartouche appears above each of the county maps. This antique county map of Hertfordshire was published by Francis Grose in "Supplement to the Antiquities of England and Wales" in 1787 using John Seller's maps of 1695. Later coloured by hand. An antique county map of Hertfordshire divided into hundreds engraved by James Wallis. Published in his 'New British Atlas' in 1813 by S.A. Oddy. Shows county town, market towns, Parks, Seats, Rivers and Navigable Canals. Original wash colouring. This antique county map of Hertfordshire was published in the "Parliamentary Gazetteer of England and Wales" in 1834. The colouring is later. Inset view of St. Alban's Abbey Church.Two vertical folds. This highly decorative antique county map of Hertfordshire has been embellished with armorials and other features. Vignette views of St. Alban's Abbey and Cashiobury. Was first published in 1836 and subsequent editions were published until 1852. This map includes railways and has been coloured by hand. An antique county map engraved by W.H. Toms drawn by T. Badeslade published in "Choreographia Britanniae. Or a new Set of Maps of all the Couinties of England and Wales" published in 1742. A short split to centrefold strengthened on verso with archival tape. An antique county map published in Laurie & Whittle's 'New and Improved English Atlas Divided into Counties' in 1807. Original outline colouring. These maps were first published in "The Universal Magazine" and are engraved by Benjamin Baker. Some age toning and occasional spotting. More Info An antique county map by J. & C. Walker, published in 'Hobson's Fox-Hunting Atlas; containing separate Maps of every County in England and the three Ridings of Yorkshire; comprising forty-two maps, showing the Roads, Railways, canals, Parks, etc., etc' . Hobson used maps printed from the Walkers' lithographic plates, and added features relevant to fox-hunting: the territory of each hunt is outlined in watercolour, and the places of meets are indicated by black spots. Circa 1870. Original outline colouring. Some offsetting. An antique county map by J. & C. Walker, published in 'Hobson's Fox-Hunting Atlas; containing separate Maps of every County in England and the three Ridings of Yorkshire; comprising forty-two maps, showing the Roads, Railways, canals, Parks, etc., etc' . Hobson used maps printed from the Walkers' lithographic plates, and added features relevant to fox-hunting: the territory of each hunt is outlined in watercolour, and the places of meets are indicated by black spots. Circa 1870. Original outline colouring. Some offsetting. More Info An antique county map by Benjamin Pitts Capper, who compiled only one atlas, "A Topographical Dictionary of the United Kingdom", Published January 1st, 1808 by R. Phillips, Bridge, Street, Blackfriars, London. The success of this atlas is reflected in the number of subsequent editions. The map was engraved by H. Cooper. Full original colour. An antique county map by Benjamin Pitts Capper, who compiled only one atlas, "A Topographical Dictionary of the United Kingdom", Published January 1st, 1808 by R. Phillips, Bridge, Street, Blackfriars, London. The success of this atlas is reflected in the number of subsequent editions. The map was engraved by H. Cooper. Full original colour. A miniature antique county map by John Cary and like all his work work, the engraving is extremely fine, and although it is a small map it is clearly defined. London, Published by G. & J. Cary, No. 86 St James's Str. Published in 1824 with original hand colouring. The title is at the top with a semicircular compass above. At the bottom there is a table of distances from London. They came about at a time when roads were being used as never before, and therefore the need for accurate road maps was imminent. Good margins and fine condition. This antique county map of Hertfordshire by John Aikin was published in "England Delineated" in 1795. It is simple in style, showing only the county outline with major towns and rivers. This is quite a scarce map. An antique county map of Hertfordshire engraved by Sidney Hall and published in "A Travelling County Atlas with all the Coach and Rail Roads accurately laid down and coloured and carefully corrected to the present time." Published in 1842 with original outline colouring. Centrefold as published. 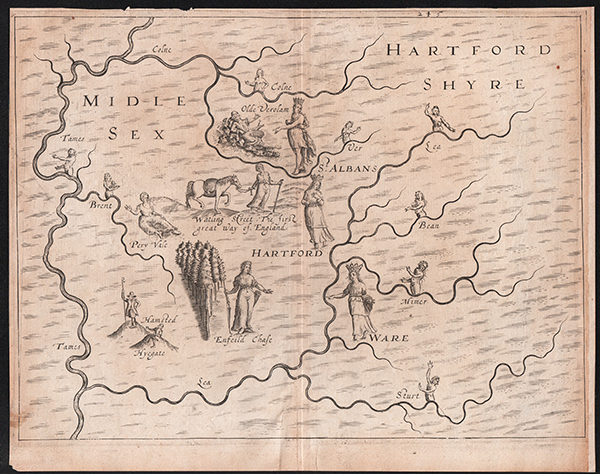 Richard Blome's " A Mapp of Hartfordshire with its Hundreds" from "Britannia: or, a Geographical Description of the Kingdoms of England, Scotland, and Ireland with the Isles and Territories thereto belonging". Published in 1673. A nice dark impression. Uncoloured as published. An antique county map of Hertfordshire by Henry George Collins. Produced by lithographic transfer. Circa 1850. An antique county map of Hertfordshire engraved by J. Roper from a drawing by G. Cole. Interesting in grading the roads, locating archaeological sites, mail coach routes etc. Originally produced to accompany the "Beauties of England and Wales". Published in 1805. Full original hand colour. More Info An antique county map of Hertfordshire from 'English Topography or, A Series of Historical and Statistical Descriptions of the several Counties of England and Wales.' Printed for Baldwin, Craddock, and Joy Paternoster-Row. Published in 1816 with contemporary outline colouring. This map was engraved by John Roper and drawn by George Cole. and originally issued to accompany 'The Beauties of England and Wales' and issued in the 'British Atas' in 1810. An antique county map of Hertfordshire from 'English Topography or, A Series of Historical and Statistical Descriptions of the several Counties of England and Wales.' Printed for Baldwin, Craddock, and Joy Paternoster-Row. Published in 1816 with contemporary outline colouring. This map was engraved by John Roper and drawn by George Cole. and originally issued to accompany 'The Beauties of England and Wales' and issued in the 'British Atas' in 1810. Distance Table - Rev. Thomas Cox. An antique distance table by Rev. Thomas Cox for towns in the county of Hertfordshire. Embellished with coats of arms of Hartfordshire and Hartford. Published in "Magna Britannia" in 1738. Left margin cropped to printed border encroaching on to printed area on the top. An antique county map of Hertfordshire published by Samuel Lewis in his "View of the Representative History of England" in 1835. Drawn by R. Creighton and engraved by J. & C. Walker. The map clearly pin-points the electoral divisions. Original outline colouring. An antique county map of Hertfordshire with scale and compass rose, published in 'Leigh's New Pocket Atlas of England and Wales' by M.A. Leigh in 1834. An antique county map of Hertfordshire engraved by J. Roper from a drawing by G. Cole. Interesting in grading the roads, locating archaeological sites, mail coach routes etc. Originally produced to accompany the "Beauties of England and Wales" (London 1801-1818). Full original hand colour. An attractive antique county map of Hertfordshire drawn and engraved by Joshua ARCHER and published by Thomas DUGDALE in 1847. Has been coloured by hand.